Classified car-buyer stabbed | What Car? A car-buyer was repeatedly stabbed, kicked and beaten when he went to Barking in east London to buy a VW Golf advertised on the site Gumtree. The attackers then stole 5000 he had taken with him to buy the car. The victim required open-heart surgery and is expected to take months to recover. The true owner of the car wasn't even aware that it had been offered for sale. Meanwhile two men have been arrested in connection with the attack and were given bail. This horrific attack highlights the potential dangers car buyers are exposed to when buying a car privately. However, if you take some common-sense precautions, you can keep yourself safe while netting a bargain. 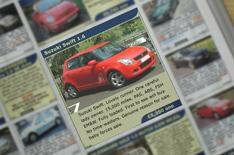 • When phoning about something you've spotted in the classifieds, always say: 'I'm phoning about the car for sale'. If the seller asks, 'Which one?' they're probably a dealer or back-street trader posing as a private seller. The car you're after might not be fit for sale on a forecourt, so they're trying to off-load it to an unsuspecting buyer. • If a seller insists on contacting by email only, stay away. • Don't go to see the car on your own. • Go in daylight not only will you feel safer, you will be able to examine the car. • Avoid car parks, industrial estates and remote locations it's not safe, and an honest buyer shouldn't want to meet you there. • Visit the car at the seller's address, or at the very least their place of work. Also make sure that they're not just pretending to live or work there you should also get a landline number for the seller as well as a mobile one. Call the landline before seeing the car. If it goes straight to answer machine, keep trying until you speak to the seller. • Don't take large amounts of cash when viewing a car. It's always a good idea to see the car when the banks are open. That means if you end up buying it, you can hand over the cash inside bank. Tell the seller this is what you'd like to do when planning to view the car. • Remember bona fide sellers won't mind answering your questions - only those with something to hide. • Get a vehicle history check. That way you can find out if the car has been stolen, written off or has any outstanding finance on it.